A sleek and peaceful rabbit to grace your lawn or garden. Onlookers may mistake this statue for the real thing! 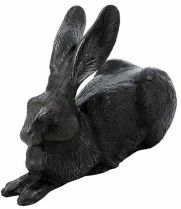 A sleek and peaceful rabbit to grace your lawn or garden.